Your name is Charles Andrew Williams. You are fifteen. Correction. You were fifteen. On March 5, at 9:25 a.m., you became timeless. Immortalized. Infamous. When you went on a shooting rampage which killed two people and injured 13, you lost your age. You lost your name. And you lost your identity. Now you're reduced to a human jigsaw. Your life story has been scattered about and snapped into place by the media. And the pieces still don't fit. "He's always picked on, he's scrawny, he's little. People think he's dumb." You're in a daze as you sit in the back of the patrol car. The cuffs are so tight they leave their pinched imprint on the insides of your wrists. A circular tattoo. The seats in the back of the patrol car are hard and plastic: the more you shift to get comfortable, the tighter the handcuffs constrict. The muscle cramps in both thighs become more intense. "The whole weekend he was talking about it, and me and my friends were like, 'You're not serious, are you?' And he says, 'I'm just joking.' And then he asked us if we want to do it with him. And we were all, 'You're just joking.' He was like, 'I am. I'm just messing around.'" -Josh Stevens, 15 -- classmate and friend of Charles Andrew Williams. The media swarms around the patrol car and the flashes from all the unblinking eyes of the DVC-Pro minicams explode in slow-mo like silent bombs. A mask of shock and malaise is painted on your face. One of your classmates, John Schardt, takes pictures with his camcorder as you came out of the bathroom. He told reporters and anybody who would listen that you were smiling as you emptied the chambers. But you're not smiling now. "Andy is real nice. He was a sweetheart...I thought he was popular...he's very popular. I hung out with him and we talked about normal kid stuff. He wore the same goofy yellow shirt every day. He was just over at my house Saturday night." -Thirteen-year-old girl who asked to remain anonymous, who dated Charles Andrew Williams last year. Before you were timeless, you were fifteen, and when you were still fifteen, you had mad issues. You used to live in Brunswick, a small Frederick County town in western Maryland. Your moms -- Linda Wells -- and pops -- Charles Jeffrey Williams, divorced. You had friends in Brunswick. You miss your homies. You miss your moms. You haven't been around her in ten years. Linda moved with your older brother Michael, to North Augusta, South Carolina. Your moms fawned over Mike. She placed an ad in the North Augusta High School yearbook that read, "Mike, thanks for being a great son. I am and always will be proud of you." Your moms never talked about you. A neighbor of Linda's in North Augusta, Sandy Ferarra, told the Los Angeles Times, "I never knew she had a son, I had never seen the boy." Charles took you with him to Santee, Ca. It's a northeastern suburb of San Diego. When a reporter told your moms what you did, she burst into tears. She said you were a good-natured boy. A day later, she apologized to the families of the dead. She told local CNN affiliate WJBF, "My heart goes out to them. They've lost their babies, their hopes, their dreams for their futures." When asked about you, her good-natured boy, your moms seemed to have recanted that statement. "He's lost," she told another reporter. "His future is gone." "He was scrawny, he was funny. He tried to be everybody's friend." -Aaron Brittingham, 17 -- friend of Charles Andrew Williams. You didn't aspire to be timeless. You wanted to be popular. Some people get the two ideals twisted. But not you. You tried your best to get along. You cracked jokes. You tried to be nice. You tried to fit in. You shot hoops with the new kids. You rode your skateboard in the neighborhood. Two of your skateboards were stolen. The bullies and the playa-haters made fun of how small you were. Called you the Indian In The Cupboard after the tiny character in the movie of the same name. Called you Bad Andy, after a TV commercial where a freakin' demented ragdoll always tried to throw salt in the game for the employees of Dominoes Pizza. The disses were relentless. Freak. Nerd. Dork. You tried to fit in. You stayed out past curfew. It was reported you even blazed a few trees of weed. But the haters wouldn't stop. It was too much. You knew it was time to make moves. "We didn't search his backpack...only searched his body. We patted him down." -Alex Ripple, 14 -- a classmate who got wind of the intentions of Charles Andrew Williams. You bragged about all of the guns your pops had. You boasted about the access you had to the gun cabinet. A gun cabinet that Charles Jeffrey Williams insisted to police investigators was locked. You told your boy Josh Stevens and about twenty other people over the weekend how you were going to go on a shooting spree. Chris Reynolds, the 29-year-old boyfriend of Josh's mom, Karen, heard you talking but didn't think you were serious. He even told you, "I don't want another Columbine here at Santana." And you told him, "No, nothing will happen, I'm just joking...I wouldn't be stupid and do something like that." You even said that your father's guns were locked up. Now Chris is crying on the evening news and grieving in soundbites. "I'm upset with myself for not doing anything, " he told one reporter. "I made a bad choice." "He pointed the gun right at me, but he didn't shoot." -Andrew Kaforey, a classmate who, after hearing the gunshots, came face to face with Charles Andrew Williams. Monday morning. It's your day, dog. The next few minutes at Santana High School will alter the course of the rest of your life. The moment is seismic. What Kierkegaard would call his personal earthquake. Or was it Kant? Whatever. It's your Career Defining Moment. You have hidden the .22-caliber revolver in your backpack. You're in the boy's bathroom (hey, the bathroom motif is appropriate; is it true that you brought a water-gun filled with pee to school a few weeks ago, and sprayed people with it?). You pull the trigger. 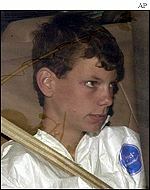 Bryan Zuckor, 14, and Randy Gordon are murdered. Shot in the back. Zuckor dies on the urine-stained floor next to a toilet. Gordon dies in the ER of Grossmont Hospital. You walk out and reload as many as four times. You fire off more than 30 shots. You come face to face with Andrew, but you don't shoot him. John Schardt -- yeah, remember him? -- has you in the cross-hairs of his viewfinder and captures the work in a montage of still and live-action footage. The police will confiscate this evidence. But don't be surprised if it winds up on 60 Minutes. Or 20/20. Or Dateline. Or the highest bidder. You walk out into the quad and continue to bust off shots. Thirteen people are wounded. Schardt tells the media. "He had an evil kind of sadistic demeanor to him. It was incredible." Of course you were smiling! He was taking your picture! Duh?! "...how saddened we all are to know that two students lost their lives in a disgraceful act of cowardice..."
-President George Walker Bush, weighing in on the actions of Charles Andrew Williams. Here come the cops. You race back in the bathroom. You get on your knees and surrender. You tell the cops, "It's only me," as if it was just a game of charades. Or paint ball. But it's not. Randy Gordon will be absent from the Navy's basic training this July. He wanted to be a pilot. One of his friends, Chris Mazzi, 18, placed a sign in front of Santana High School that read, "You're flying now, Randy." Bryan Zuckor won't be skateboarding anytime soon. He won't be playing in anymore basketball games. His coach, Dan Scott, called him a "rebounding machine." He won't be there to help his mother, a single parent, with his two younger siblings. A neighbor, Ruth Ashcraft, expressed her anguish to USA Today. "He was her rock," she said. The President of The United States has gone on national TV and labeled you a coward. San Diego County Sheriff's Department Lt. Jerry Lewis said you were "an angry young man." Well Charlie, you know what they say. Careful what you wish for. And boy, did you get it. Popularity. Boom! You done blew up, dog! On the local 11 p.m. news in Baltimore, Md. -- near your old stomping grounds in Brunswick -- they obtained a home video of you filming yourself in the bathroom, mugging, giggling, taking long, lingering shots of the toilet (what's up with that? ), and your voice over: "I hate it there," you said, talking about Santana High School. "Nobody is nice there. They're stupid." Your boys Josh and A.J. have caught the mad fame, too. They were crying on 20/20, remorseful that they didn't tell anybody about your plans. Josh talked about the song by the group Linkin Park, and the lyrics that you loved so much: "Things aren't the way they were before/ you wouldn't even recognize me anymore..." Thanks to you, they've been asked to transfer to another high school, for their own safety. You've even become an inspiration for other kids. A fourteen-year-old girl at a Roman Catholic middle school in Wiliamsport, Pa. An eight-year-old boy at a school in Philadelphia who came to school with a loaded shotgun and threatened a bloodbath. A high school freshman in Harlingen, Texas, who was caught with a "hit list." Do you know how popular you are, Charles? Do you? Only God knows, as you ride to the police station, riding the ride that you will remember until you take your last breath. Okay; exhale. Now, it begins to come back to you. Before they place you on a suicide watch, it becomes crystal clear. Your name is Charles Andrew Williams. You used to be fifteen years old. But on 03.05.01, at 9:25 a.m., you became timeless.